When did sports leagues decide the the best way to decide their biggest games was to throw away the rule book and procedures at the most stressful moments of the championship? To ignore the standards that got the teams to the Finals? For as long as I can remember “Let the players decide it” has been the mantra employed in telling the referees or umpires to put away the rules when the stakes are highest. In other words, let’s not have the championship decided by a penalty call. Even when it’s a penalty. Neither of the two referees initially seem to have noticed the check at mid-ice, and Wilson escaped discipline for the charging foul. He was given an interference penalty, after refs retroactively confabbed on the subject. To many Canadians it was reminiscent of a check delivered by Vancouver’s Aaron Rome on Boston’s Nathan Horton in the 2011 Finals, a late hit that concussed Horton and took him out of the series. Rome was suspended for four games— effectively the rest of the series. It was a major factor in the injury-racked Canucks losing the series. Wilson? He was back playing for the Caps in Game 2 (he got an assist) after much tut-tutting and finger wagging from NHL officials. As if a strong lecture would set him straight. As if he tried it in the regular season he would not be suspended for multiple games. It’s not like it’s his first rodeo. The 24-year-old was handed a three-game suspension after breaking the jaw of Penguins forward Zach Aston-Reese in the Eastern Conference semifinals. "There are going to be hits," an unrepentant Wilson said later. "It's a contact sport. That's all that I saw." Maybe if Marchessault had been as seriously hurt as was Horton the league might have punished Wilson. Then again, maybe not. Come on, Jake, it’s just Playoff Town. On matters less dramatic the league has again tossed aside most of its cherished narratives about obstruction and interference. The league that is now faster, quicker, more dynamic than it’s ever been. But the NHL seems to have empowered the clutchers and grabbers again. In Game 3, there was a sequence late in the game where refs ignored a series of trips, grabs and obstructions in service of the “let the players decide” mantra. Three chances at an empty Vegas net were thwarted by clear fouls. Even Jim Hughson was moved to observe that petty crime was paying. Finally, after one trip too many, Derek Engellund of Vegas was fingered for a penalty. Only to discover on video that it was another Caps player who’d tripped his own teammate. Not Engellund. Who spent two minutes as Jean Valjean in the box. What to do? When the NHL says let the players decide, they’re saying let the slower, less skilled players decide it. Like someone pays big bucks to see fourth liners. The league has always preached the gospel of the plucky underachiever over the star, and it always will. The NBA, too, has gone wobbly on policing its own game. Moving screens resembling NFL blocks and late-game hacking harken back to the days of the Bad Boys of the Detroit Pistons era in the 90s. The flippers have been up between players such as Canadian Tristan Thompson as tensions from fouls rise. 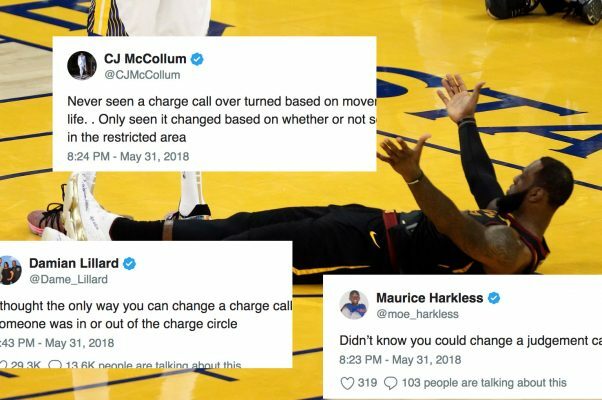 While most of the discussion after Game 1 of the NBA Final was about Cleveland’s J.R. Smith forgetting the score (allowing Golden State to win in overtime) the real head scratcher was referees going back to video of a LeBron James block to change their call. While looking to see if James was outside the restricted area under the hoop, the officiating crew decided to change its original call from a charge on Kevin Durant to a foul on James. That sequence allowed Durant to tie the game with two fouls shots. And set up Smith’s brain lock at the end of regulation. Which begs the question: Is NBA reffing now like the Robert Mueller investigation? You go in looking for Russians, you come out instead with perjury, obstruction and tax allegations?